The app displays forest change on the mobile devices in the hands of forest managers, indigenous communities and law enforcement anywhere in the world, regardless of connectivity, so that deforestation can be located and reported easily. After first installing the app and caching data to the mobile device, the app directs users to nearby forest clearing, even in the absence of a cell signal. It also enables users to capture photos and fill out forms about deforestation they encounter, which they can upload when back within Internet reach. Forest Watcher allows users to designate area(s) of interest to monitor, download various satellite-based forest change and other contextual data (e.g. near real-time deforestation alerts, protected areas and intact forest landscapes) and collect information including GPS points and photos through customisable forms. They can also review, analyse and download data collected via the app. The app is open source, free to use, and available in English, French, Portuguese, Spanish and Bahasa Indonesian. Systems like GFW monitor forests remotely, but people on the frontlines of deforestation often lack Internet connection needed to access and act on this information. Often because of the size of areas to the covered couple with resource and capacity constraints, rangers can miss deforestation encroaching beyond their regular routes. Or they might find out about it too late. The Forest Watch app would be critical in avoiding such situations. It helps ensure that the benefits of big data reach those on the frontlines who need forest information most. 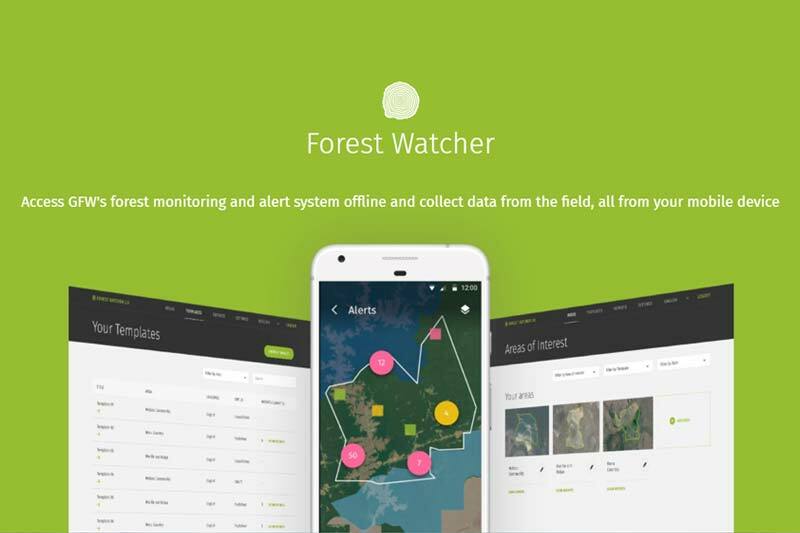 An earlier version of Forest Watcher has been developed and used in Uganda since 2014 by the Jane Goodall Institute (JGI). JGI trained hundreds of private forest owners, forest authority offices and protected areas rangers how to use mobile tools to navigate to GFW deforestation data in the field and collect evidence to support conservation action, leading to prosecution and fines for offenders. In Indonesia, HAkA, an Aceh based NGO in Indonesia, deployed Forest Watcher with local forest monitors in the Leuser Ecosystem – the last place on earth where orangutans, rhinos, elephants and tigers are found together in the wild. Previously, these rangers would manually inspect raw satellite imagery and send patrols to the field to collect information using pen and paper. With the app, they can quickly locate new alerts automatically detected by GFW, and collect GPS points, photo evidence and descriptions of the scene on their devices. This allows them to more efficiently report evidence to local authorities, increasing information available for investigation and prosecution of illegal activities. These improvements also support broader efforts against deforestation. Forest Watcher can support initiatives like REDD+ (Reducing Emissions from Deforestation and Forest Degradation) and corporate zero-deforestation commitments, both of which require reliable, affordable consistent monitoring to be effective.